Passed in 2010, SB 1070 was Arizona’s attempt to have local police become more involved in enforcing immigration laws. Although it added a burden on the police, the law generated a great deal of publicity regarding the state of affairs along Arizona’s border. It gave fearful people something to think about, taking their minds off of the devastating effects of the Great Recession. Regrettably for Arizona, most of the publicity was highly unfavorable. As the political leadership in Phoenix flaunted its idiosyncratic bizarreness, Arizona became known as a hothouse of intolerance and/or a place where elected officials were too inept to understand the difference between federal and state policing responsibilities. Arizona’s actions antagonized the neighboring Mexican state of Sonora at the same time it brought heaps of unflattering publicity upon itself. All this was occurring at a time when federal border enforcement was on the upswing, the number of illegal borders crossers was dropping and trade with Mexico was increasing. It appeared that Arizona’s goal was to freeze trade, encourage tourists to stay away and push up the unemployment rate. The effort to implement SB 1070 soon ran into legal problems as large parts of the law were swiftly negated by the courts. The legal bills mounted as flinty state officials continued to push implementation. In retrospect, the spending on SB 1070 legal fees might have been put to better use supporting the investigation of child protection cases. In 2009, Arizona’s merchandise exports to Mexico totaled $4.5 billion. At the end of 2012, they stood at $6.2 billion, an increase of 37%. During the same time period, exports from Texas to Mexico climbed from $56 billion to $94.4 billion, up 68%. Texas, which has a longer border with Mexico and more resident illegal migrants, seems to have a better working relationship with federal authorities. Officials in Texas also consider economic issues in their calculations regarding border security. The broader Texas prospective has paid dividends. In November 2013, the unemployment rate in Arizona was 7.8%. Texas did much better at 6.1%. While Arizona struggles to get involved in border policing and fencing, the Texans leave that problem to the feds while they push improved economic relations and ship products to Mexico. The immigration reform bill passed by the U.S. Senate and stalled in the House contains loads of border security enhancements. Our security focused governor might want to drop a hint to the state’s representatives in Congress that they should get to work getting the bill unstuck. They do not have to work alone because the U.S. states sharing the international border with Mexico have a total of 101 representatives drawing salaries in Washington, DC. Arizona’s legislature begins a new session this week. 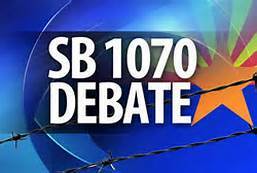 The incoming legislature should consider taking a look at the costs and benefits stemming from our celebrated SB 1070 endeavor. To many outside of Arizona, it appears as a disconcerting way to duplicate federal policing efforts while dissipating a lot of local time, talent and money. 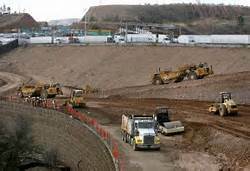 The major expansion of the Mariposa port of entry at Nogales (paid for by federal stimulus funds) will be completed this spring. It will speed up the movement of trade valued at $20 billion annually through the port. About 25% of Arizona’s manufacturing workers depend on exports for their jobs. A number of states including Texas, allow the children of illegal immigrants to attend school at in-state tuition rates. With an educated workforce a necessity for Arizona’s future economic betterment, the governor ought to reconsider her position on certain border and immigration issues. The task of developing a viable economy should have equal billing with border security concerns.